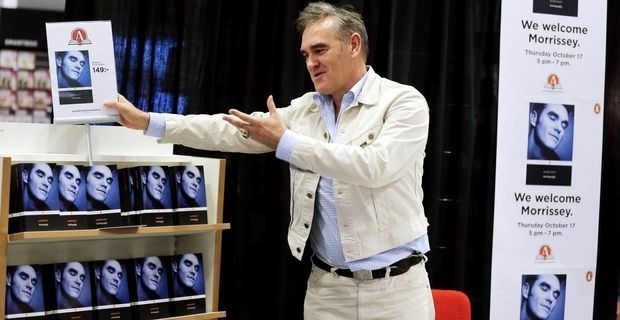 To the outraged jealousy of authors everywhere, Morrissey's Autobiography was published as a Penguin Classic. That accolade is usually reserved for revered members of the literary pantheon, but Morrissey demanded it and had the clout to get Penguin to agree. Morrissey's musical career may be in the doldrums, but his personal utterances still have plenty of cachet, judging by the feverish haste with which the media absorbed his book and rushed to share their impressions. Initial reactions were mostly favourable, with reviewers enjoying Morrissey's overwrought, self-regarding prose style, which reads like Alan Bennett trying to be a Lancashire Proust, but with the kind of grammar that cries out for an editor. By the admittedly low standards of rock autobiographies though, it has to be said that Morrissey's effort is in a different league. Neal McCormick in the Telegraph went as far as saying that Autobiography was the best-written musician's book since Bob Dylan's Chronicles. Like Dylan's work, Morrissey's is an unreliable but evocative memoir rather than a factual chronology of what happened next. It does contain rather more personal revelations than Dylan ever let slip. Smiths fans may be frustrated that Morrissey devotes only 75 pages to the band which many believe was his musical zenith, and does not shed a great deal of light on what caused him and Johnny Marr to break up the band in 1987. By comparison he devotes 50 pages to his legal problems. He has never quite got over being described by a judge in the Smiths royalty dispute as "devious, truculent and unreliable where his own interests were at stake." Even Morrissey's own lawyer admitted the singer had a "degree of arrogance". In the book it is still in evidence, although he tempers it with the flamboyant and comical self-deprecation that made him such a revelatory frontman back in the 80s. Dylan's Chronicles revived interest in an iconic musician and ushered him towards a fruitful career revival. It's not impossible that Autobiography may have reminded Morrissey of the qualities that made him successful in the first place.